This one courtesy of my Aunt. Cut tomatoes in half, lengthways. Place the tomatoes , cut side up on an oven tray, sprinkle with sugar. Bake, uncovered, in a hot oven for about 10 minutes or until just tender. For dressing, combine vinegar, mustard and the extra sugar in a small jug. 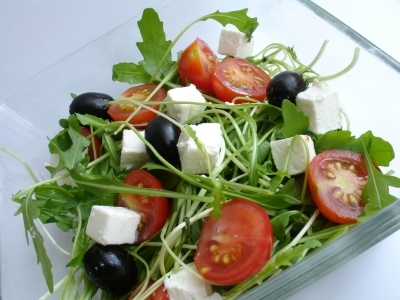 Just before serving, combine rocket, onion, olives and tomato in a large bowl, drizzle the dressing over the salad and scatter with the feta cheese. You won’t forget this one.